Just four teams remain in the Euro's. Who will come out on top in this nail-biting tournament? 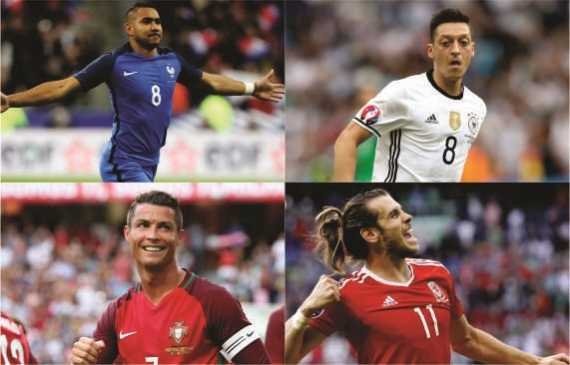 The Euro 2016 has brought us plenty of thrills, stunning goals and moments to last a lifetime. Now, just four teams remain. There is no room for error but only improvement. Which team has what it takes to go all the way? France earned a semi-final date with the world champions Germany in Marseille on Thursday following a 5-2 victory over Iceland in Paris. It was undoubtedly their best performance at Euro 2016. Les Bleus were 4-0 up first half, but took their foot off the pedal in the second, resting a few of their key players. It proved successful as France are now the only team from the final four remaining that will have their full squad available, after the return of N’Golo Kante and Adil Rami. Les Bleus have been brilliant in attack, but shaky in the back. They beat Romania 2-1, Albania 2-0, and played to a dour scoreless draw against Switzerland to top Group A. A round of 16 clash against Republic of Ireland saw France a goal down in the first minute, but a tremendous second half performance gave Les Bleus a well-deserved 2-1 victory. When France have been synchronous, they have looked as dangerous as anyone in the competition. Nevertheless, even when they have floundered at times, they've always been able to fall back on moments of individual brilliance from the likes of Dimitri Payet, Antoine Griezmann, Paul Pogba and Olivier Giroud. France last won the 1984 European Championship on home soil, they won the 1998 World Cup on home soil, and they're on course to win the 2016 European Championship in front of their die-hard supporters yet again. Germany haven’t always been at their best, and that just shows the quality which the team possess. Die Mannschaft beat Ukraine 2-0, played to a goalless draw against Poland and then edged Northern Ireland 1-0 to reach the round of 16. Slovakia were next up, and proved to be no match for the Germans who stormed to a 3-0 victory. The quarter-finals saw Die Mannschaft go toe-to-toe with Italy. Joachim Low went into the encounter using Italy’s 3-5-2 formation, as they did in a friendly against the Azzurri in March – won 4-1 by Germany. And Die Mannschaft prevailed yet again, this time they needed penalties to separate the sides, however, it was still a stroke of genius to defeat Italy with their own formation. Germany will be without Mats Hummels for the semi-finals due to suspension, while Sami Khedira and Mario Gomez have been ruled out with injuries. Those three make up the muscular spine of the team, three players who have been Germany regulars for years, and they will certainly be a lesser side without them. Die Mannschaft will likely return to their 4-2-3-1 formation, and opt for Mario Gotze or Thomas Muller to take up the role of a ‘false 9’. Germany haven’t been at their prolific best in attack, and will need to turn up the heat against Les Bleus. Low’s men are just a single game away from the final at Stade de France, and the chance to win a second successive major trophy. Portugal were the first team to qualify for the semi-finals, beating Poland on penalties after the teams played to a 1-1 draw. Some may say the Portuguese don’t deserve to be in the last four as they are yet to win a match in 90 minutes, drawing all their group games, but progressing as one of the best third place teams. The round of 16 saw Portugal edge Croatia 1-0 in extra-time, after the sides played to a goalless stalemate, with Ricardo Quaresma providing the only goal of the game. William Carvalho will miss the semi-final against Wales after picking up a second yellow card against Poland, whilst Portugal centre-back Pepe is an injury concern after the Real Madrid defender missed training as a precaution on Monday due to a ‘thigh muscle pain’. Despite his outstanding performance against Hungary in the group stage where he scored twice and assisted one, Cristiano Ronaldo has been nothing more than ordinary. Portugal have reached this stage with Ronaldo nowhere near his best form and, in a way, that has been good news as it proves there is enough talent available to make up for his underwhelming performances. It has been a team effort. They have shown plenty of hard work and an enthusiastic fighting spirit. Renato Sanches has been making strides, and proving just why Bayern Munich paid a reported 35 million Euros for the talented teenager. Portuguese coach Fernando Santos managed Greece until 2014, the side who denied Portugal 10 years earlier by playing cynically. Is it time for the Portuguese to triumph in a similar manner? Wales have been simply captivating, and along with Iceland, have been truly remarkable to watch. Against all odds, Wales topped Group B ahead of England, Russia and Slovakia. They were then expected to oust Northern Ireland in the round of 16, but they only managed to do so courtesy of a Gareth McAuley own goal, as Wales claimed a 1-0 victory. They were then pitted against the mighty Belgium, whom they stunned 3-1 after going a goal down to reach their first ever major semi-final. What makes the Wales story so uplifting is that they are much more than the sum of their individual parts, even allowing for the brilliance of Gareth Bale, who has scored three goals. They improve not just in each other’s company but also under the coaching of an off-field team headed by Chris Coleman. The big worry is the depth of the Wales squad and the fact that two soft bookings will deprive them of two very important players in Aaron Ramsey and Ben Davies. Ramsey has been one of the best players at the Euro 2016, and has been arguably more influential than Real Madrid forward Bale, having been involved in five goals, which include four assists and one goal. James Collins, Andy King or David Edwards will surely be called upon but the team will be weakened. Nonetheless, the Dragons have shown enough hunger and desire to go all the way, and if they can work for each other, and play to their strengths just as they did against Belgium, Wales will definitely have a shot at becoming the next European champions. I said it from the beginning, France will win the Euro. They still in it, and look hungry enough to emerge victorious. Germany will be without a few key players for the semi-final clash, and I’m confident Les Bleus have more than enough quality to expose Die Mannshaft. France have stepped up their game since reaching the knockout stages and look well worth a punt to lift the European Championship. With the fantastic support of their besotted fans behind them, Les Bleus look well on their way to being crowned champions of Europe.